I find pop-tarts really disgusting. 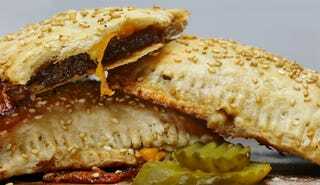 But these I Can Haz Pop Tart burgers must be delicious: "a smashed grass-fed beef patty, with a bacon onion jam, melty cheddar cheese, in a buttery pop tart pastry." I just want to wake up every day, open my mouth, and have a conveyor belt pushing six of these down my throat.